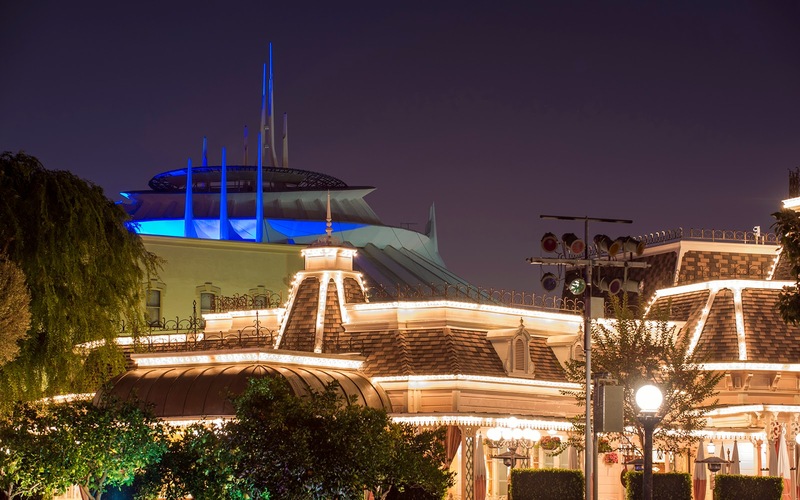 I've always thought that the view from the head of The Hub over toward Space Mountain was an interesting juxtaposition between the turn-of-the-century Victorian charm of Main Street U.S.A. and the futuristic sleek lines of Tomorrowland. There's such a contrast in styles, and Space Mountain seems to loom unnaturally large over the Plaza Inn. This contradicts the basic theming philosophy of keeping each land contained and feathering transitions to prevent any jarring overlay of themes, but that's just what happens here due to viewlines. On the other hand, this scene has been like this for so many years that everyone's just used to it. And indeed, even though it doesn't make technical sense, I actually like the way these two structure interact with each other, visually. It just makes for an eye-catching scene! Space Mountain looms over the Plaza Inn.